You know how in-game romances go: you say whatever it takes to get your love interest. Usually, all you have to do is be nice to another character and willing to listen to their life story for like 30 minutes and boom, they're in the bag forever. 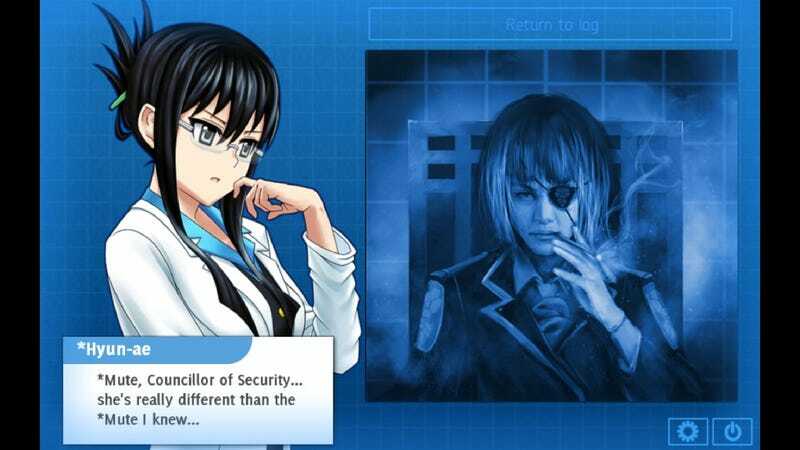 Still, I ended that game by romancing the AI, meaning that she's still my in-game girlfriend in Hate Plus. And like any couple would, she wanted us to celebrate something—specifically, by baking a cake. I said I would, like a good boyfriend (I'm playing as a guy). It's just a game, right? Whatever, I'll say what I need to say. ...except I didn't expect the game to require me to bake an actual cake, and to keep track of time as a means of making sure I actually baked a dang cake. Meaning, if enough time hasn't passed, the game knows I didn't bake diddly squat. Don't worry. She'll give you a recipe. Do you have the ingredients? She'll ask you to check. Don't even think you can just click "all done" right away. The game is keeping time! The AI will chide you for not actually getting up to check. Sure, you could just wait a few minutes and game it that way—but then again, instead of just sitting around doing nothing...why not actually check? Let's say you weaseled your way out of baking a cake for your girlfriend in-game—you can do it, after all, provided you're patient enough. If you want this achievement, there's no way to get it other than actually baking a cake and sending a picture to the developer, Christine Love. If you do that, she told me yesterday, she'll send you a special code that unlocks the achievement. As of yesterday? At least 80 people have emailed her with such pictures. What's worth noting here is that the game is segmented into three days, and this cake incident doesn't happen until the third day. The game only released earlier this week, and I imagine that most players are only now/recently getting to that day given that you have to wait 12 real-world hours between days. What I'm saying is, there's bound to be a lot more people who will actually bake a real-life cake for their virtual 2D girlfriends as time goes on. If all of this seems familiar, it's because the entire thing is taking a page off the gag where Otaku will take pictures with anime characters, typically on Christmas—in Japan, it's more of a date-night than a typical holiday. Sometimes, it'll be done be for a character's birthday. Either way, it's not done completely seriously or anything, although people will try to outdo each other in the pictures. Still, as curious and ridiculous as this all is, I think this is one achievement I won't be getting. You can check out Hate Plus here, although I'd suggest playing through Analogue: A Hate Story first.